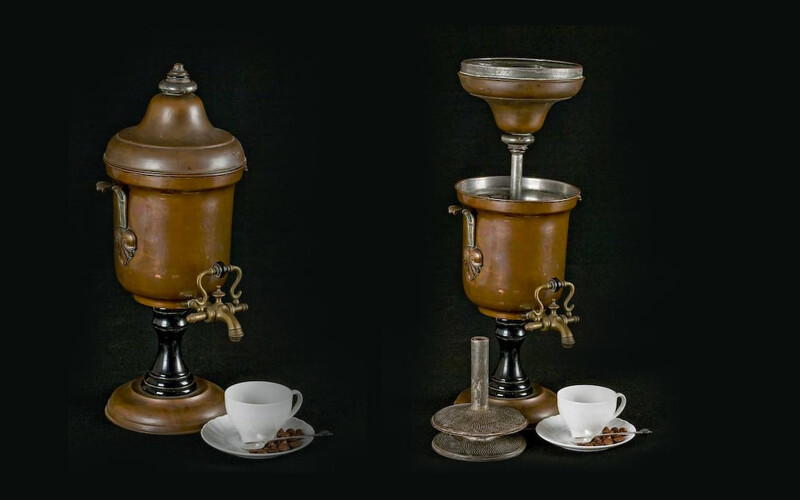 Machines in full Victorian style, produced in England by E.F. Griffiths & C., Birmingham, and Shav & Fisher, Sheffield, with a hydrostatic percolation system patented in 1854 in London and Paris by an engineer called Edward Loysel. In brass, copper and chiselled Sheffield steel. Three pint capacity (around 1.68 litres). Using the overturned lid as a funnel, hot water was poured into the central telescopic tube and mixed with the ground coffee contained in the filter at the base, thus using the strength of the pressure of the water column. The coffee was then poured into the cup from the tap at the bottom. The idea of this system is to give the water more pressure (compared with the force of gravity of percolation only) as the coffee passes through the filter in order to better extract all the aromas.